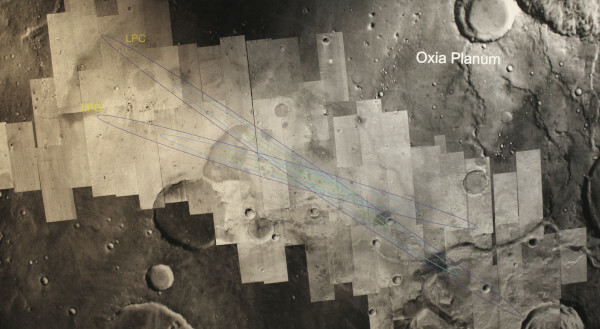 This graphic of Oxia Planum shows the potential landing site for the ExoMars 2020 mission. It was used during a meeting held here at the National Space Centre during which experts from the ExoMars Landing Site Selection Working Group (LSSWG) met to recommend a landing site for the mission. The choice of landing site was narrowed down to two possibilities, Oxia Planum and Mawrth Vallis. They are both located just north of the Martian equator, separated by a few hundred kilometres. This region shows evidence that water was present on the surface of Mars billions of years ago, making it a good place to search for signs of life. After considering both the scientific merits and the likelihood of a successful landing at each site, the group recommended Oxia Planum because it is significantly safer place to land than Mawrth Vallis. This recommendation will be reviewed by ESA and Roscosmos with an official confirmation expected mid-2019.